Film review, by Nadine Shambrook, of the thriller Searching starring John Cho as a father looking for his missing daughter. Debra Messing plays the Detective helping him. David Kim (John Cho) begins to worry when his daughter Margot (Michelle La) stops returning his calls and texts. After alerting the police, Kim attempts to uncover Margot’s whereabouts while Detective Rosemary Vick (Debra Messing) believes Margot has run away. Using Margot’s laptop, Kim discovers his daughter has been hiding secrets. Computer and phone screen narratives are becoming an established motif in horror and thriller films. For example 2014’s Unfriended (and its sequel, out later this year Unfriended: Dark Web) display the Skype and instant messaging conversations between a group of friends with horrifying consequences. Searching uses technology as part of the narrative and shows the father using his computer, phone and other forms of tech to find his missing 16 year old daughter. There is lots of love about this smart thriller and one is the way it excels at acing the use of the technology concept. It’s not the conversations between David and Detective Vick (Will and Grace star Debra Messing) that feel as though we are intruding into real lives, it’s the reactions on his face after the FaceTime call ends or hesitations over Google search terms that both digital natives and those who aren’t quite familiar with social media used will be reading into. The theme of Searching is communication, or the lack of it between father and daughter, highlighted by the use of social media sites that David uses to learn more about the type of person his daughter was before she went missing. 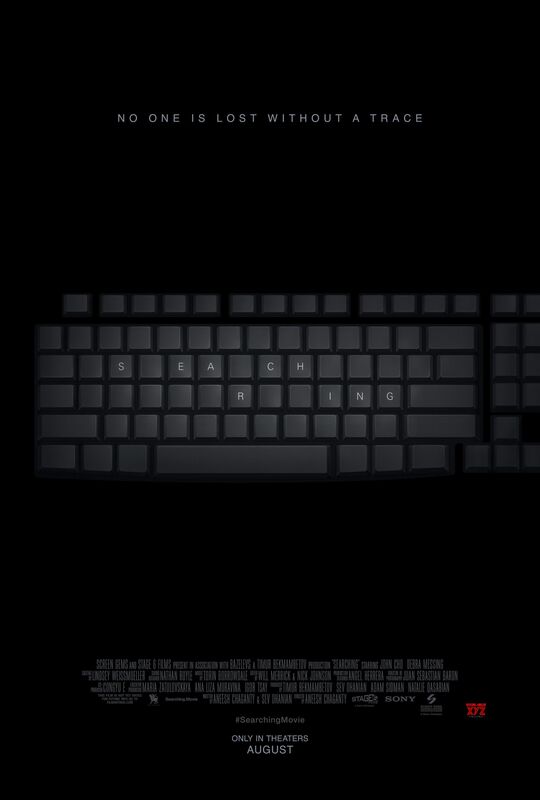 Compared to digital screen concepts in other films, Searching not only does it well but proves it can be used for more than just horrors. This is due to the fact that David uses the technology exactly how we use it. We reword our texts to hide our neediness; we read too much into messages from our friends. This film works so well as a thriller because the way characters interact with each other is believable. It’s the best use of digital technology in film; this is first time film director Aneesh Chaganty’s greatest achievement. As we saw with Hotel Artemis, a good concept still needs to deliver other aspects. Cho proves that as an actor he is much more than just Mr Sulu from the Star Trek reboots. It could be limiting for an actor to give their whole performance through videos on a computer screen, but Cho manages to portray a panicked single father believably. Searching’s concept could only work if audiences are able to keep up with David’s thought process as he attempts to find details to his daughter’s whereabouts, and luckily it’s in those facial expressions and small moments that tell us exactly what Kim is thinking. It’s a tough role that he performs with moments of anger and heartbreak with every new turn in the case. It’s a captivating, simple story of a single father searching for his daughter that has all the ingredients to keep you hooked. David is relatable while Margot is intriguing. With a couple of red herrings and shocking revelations, it’s a thriller where audiences will try to guess the ending before the characters find out but will still likely not see the discovery coming. Searching is the surprise film of 2018 so far. A triumph for director Aneesh Chaganty for making the social media film work and a career highlight for Cho. You’ll be thinking about it the whole length of the drive home and will need to see it twice. Producers: Timur Bekmambetov, Sev Ohanian, Natalie Qasabian, Adam Sidman. Writers: Aneesh Chaganty, Sev Ohanian. Camera: Juan Sebastian Baron, Nicholas D. Johnson, Will Merrick. John Cho, Debra Messing, Michelle La, Sarah Sohn, Joseph Lee, Connor McRaith, Alex Jayne Go, Megan Liu, Kya Dawn Lau.